We have had such good results in our awareness campaign for the Bahrain Coordinating Committee in such a short time, that I just had to share these preliminary results with you, in case you would like to apply any of these approaches in your own marketing and public relations campaigns. Their awareness campaign has been mounted with very little investment of funds, just lots of creativity and effort. Hopefully, we will maintain the momentum we are building! As you know, only a month ago, we launched the organization’s blog and website, using our favorite, affordable platform, WordPress.com. It’s basically an $18/year website. In only a month, the website and blog has received more than 2500 views. Even their brand new YouTube site is doing well, getting more than a hundred views for its videos less than 48 hours after the first videos were put online. The cost for that YouTube channel? Zero dollars. One of our recommendations was that the organization exhibit at the ADC Convention, the largest gathering of Arab Americans in the United States. The Committee joined forces with Americans for Democracy and Human Rights in Bahrain who created a wonderful display that received lots of attention. The organization created folders of information, and distributed 540 of them to convention attendees. 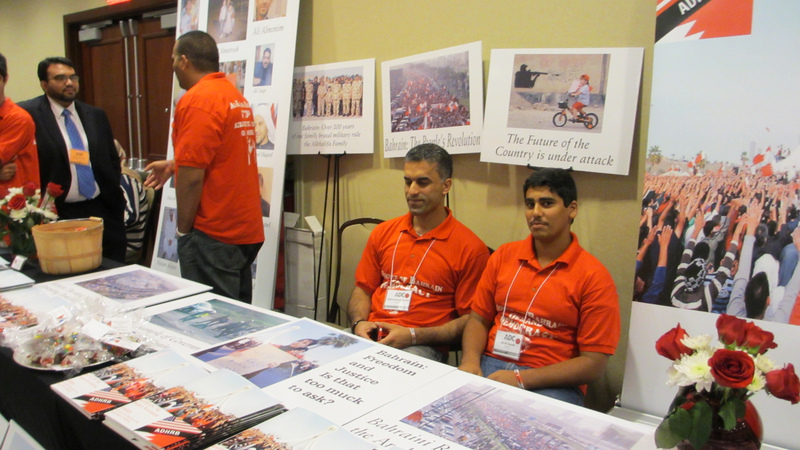 Some of the media who dropped by the booth included BBC Arabic and Voice of America. 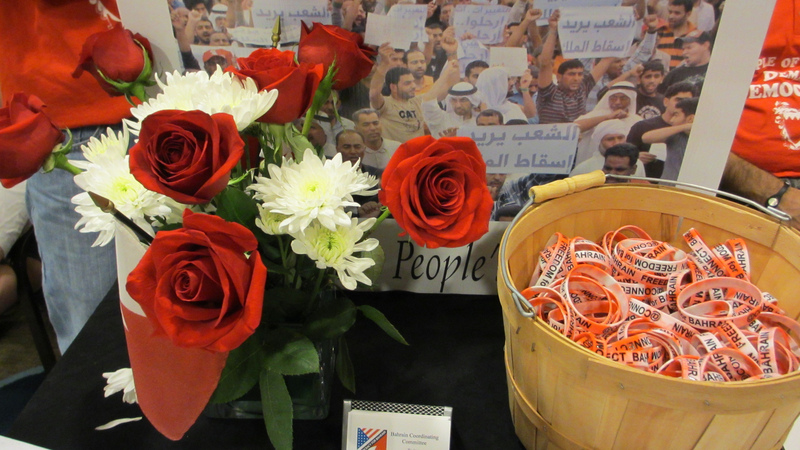 Giveaways are important at conventions, and we particularly wanted to increase awareness of the organization’s Twitter handle (@Connect_Bahrain), since that is such an important medium for communicating a movement like this. We designed and ordered rubber wristbands that had the organization’s Twitter handle and the slogan, “Freedom in Bahrain.” The exhibit volunteers gave out all 275 wrist bands (we gave out some to the press before the event), which cost the organization less than $150 including shipping, and 75 bags of M&Ms tagged with their new logo and Twitter handle, which cost about $40 to put together. Well, it worked! Over that weekend, their Twitter followers shot up from 420 to 641! Their Facebook Page fans also increased 20%. We’re very pleased to help this organization with their public relations efforts. We have put out seven press releases in the past six weeks, some on PR Newswire, and all on Free Press Release.com. The paid distribution with PR Newswire ($89 each), of course, gets very good results. We expected that. But what we did not expect is that we would receive so many additional views for our online news releases on Free Press Release.com ($1 per press release) — over 1,800 views thus far. The feedback we are receiving from the client is that there is increased interest in the organization and its work, and that many conference attendees were curious and supportive. This is all gratifying to hear. So, I wanted to share with you how these inexpensive approaches can pay off, and perhaps, they might work for your company or nonprofit organization! Please let us know in the comments if there are free or low-cost public relations and marketing tactics you have tried that worked well for you. Mary Fletcher Jones is a mom, teacher, and blogger. She is also the creator of "Living Well With Autism," an online resource for caregivers of children, teens, and adults with autism and related special needs. Posted on June 25, 2012, in Marketing Tips, Public Relations Tips, Social Media Tips, Trade Show Tactics and tagged Bahrain, exhibit marketing, Human rights in Bahrain, PR Newswire, social media, Twitter. Bookmark the permalink. Leave a comment.